Most agencies focus on the pitch, the show, the new business presentation. This is putting the spotlight on the wrong place. By then, most of the really important decisions have already been made. The really good agencies win early: the pitch merely confirms a decision. Agency baseball is all about the ability of your agency to successfully respond to a prospect’s show of interest. Your agency’s ability to handle the first interview with a prospect, and how you respond to their needs. Agency baseball is all about how to win new business, by winning in all phases of the game. Understanding baseball opens up new ways for an agency to win new business. In new business you have to run all the bases, just like on a baseball diamond, and once you’re on a base you never go backwards. There are four obstacles to getting the business. If you do not get an account, it is because your agency failed to overcome one of these four obstacles. The four obstacles are arranged like bases on a baseball diamond. First Base is the most important base to reach. The obstacle here is “No Trust.” No trust means I do not know you, therefore I do not trust you. “No Trust” means I have not heard of you, therefore I do not trust you. “No Trust” means I do not understand your experience so I am reluctant to discuss my business with you. No trust is a serious obstacle and must be overcome before any type of agency/client relationship can be built. “No Trust” blocks you from Second Base. 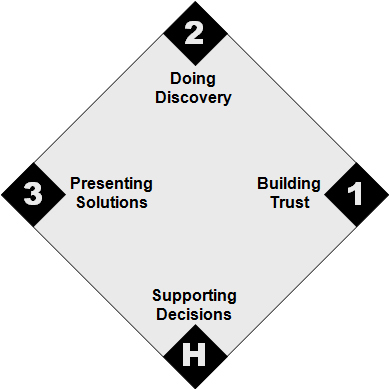 Great agencies know how to build trust by building competency, chemistry, often at the first meeting. Second Base is another obstacle called “No Need.” No need means I may trust you but I do not have a need for your specific service. “No Need” means you may be a fine agency but I do not happen to need an agency now. “No Need” means I am sure you are successful but I am happy with my current relationship. Great agencies understand how, and when, to probe. What questions to ask, when to switch from fact-finding to feeling questions. How to create pain, needs, so you have something to work with, something to solve. Reaching Home plate means overcoming the last obstacle which is “No Hurry.” No Hurry means “I know you and trust you, I do have a need for an agency such as yours, and your specific recommendation would be a help to me, but I am not in a hurry to appoint you.” “No Hurry” means the cost of putting your recommendations into effect could be higher than the prospect is willing pay. “No Hurry” is usually perceived by the prospect as low benefit compared to high risk. For an agency to play Agency Baseball, it must first understand how the field is set up and how important it is to establish Trust firmly before trying to do Discovery (going for Second). Truly effective, winning, agencies train a core group at the agency who know how to handle the leads properly, meaning which ones to forget and which ones to close quickly, perhaps within 48-hours or certainly within 7-days. Eighty percent of an agency’s problem in getting new business revolves around First Base trust problems. This is the most important base and where most agencies stumble. Agency Baseball Can Be Taught. Agency Baseball is part of our comprehensive new business training covered in both Spark and Torch training. Spark is an intensive on-site training session designed to teach you the process, skills and techniques to implement a strong new outreach program that sets up more first visits and fast close opportunities. With more leads, your agency can grow 20% plus each year, year in and year out. Torch is the most effective way to improve your agency’s performance in closing new business. Many agencies have a steady stream of prospects. But making more out of these prospects is what Torch is all about. Torch shows agencies how to visit prospects and then close the prospects your agency wants within 48 hours in some cases and within 7 days in others. Our track record for growing marketing communication firms through client retention, organic growth and new business wins is unparalleled. In any given year, Sanders Consulting Group works with most of the top ten marketing firms and hundreds of local and specialized firms. We have an extensive roster of learning programs and services that are unique in the industry. Our practice areas beyond agency growth include branding, operations, productivity and teamwork. We also assist firms with a wide variety of management concerns and ownership issues relating to succession planning, merger-sale-acquisition, leadership coaching and more. Why not give us a call and see what we have to offer? Pingback: Stop Following the Formal Pitch Process!